Are you sure you want to remove Nicomachean ethics from your list? An detailed examination of what the best life might be for human beings. In order to anwer this question, Aristotle finds he also has to examine what virtue itself is and all of the various virtues that might make up the best life. in Spanish - 4a ed. in German - 4., durchgesehene Aufl. in English - Rev. [ed.] / by J.L. Ackrill and J.O. Urmson. in English - Revised ed., crevised with notes and appendices by Hugh Tredennick. 1975, D. Reidel Pub. Co.
Ethica Nicomachea: translatio antiquissima libr. II-III sive "Ethica Vetus," et translationes antiquioris quae supersunt sive "Ethica Nova," "Hoferiana," "Borghesiana." Nikomachische Ethik. : Auf der Grundlage der Übersetzung von Eugen Rolfes hrsg. [mit Einleitung, Anmerkungen, Register und Bibliographie] von Günther Bien. 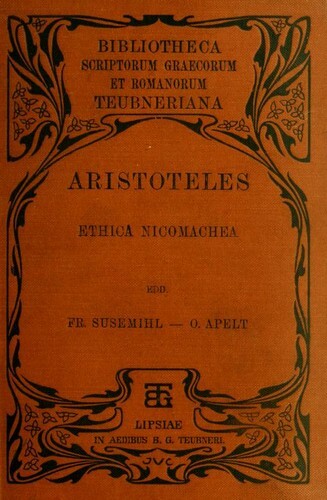 The Nicomachean ethics of Aristotle. 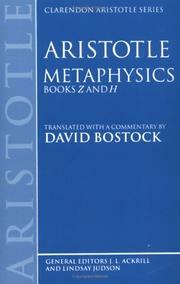 : Translated and introduced by Sir David Ross. Ethica Nicomachea. 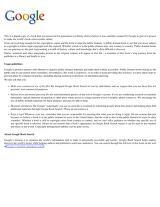 : Recognovit brevique adnotatione critica instruxit I. Bywater. Aristotelis Ethica Nicomachea: recognovit brevique adnotatione critica instruxit I. Bywater. The Nicomachean ethics. : With an English translation by H. Rackham. in Greek - New & rev.ed. in Ancient Greek - New and rev. ed. The Nicomachean ethics. : Translated by F.H. Peters. in English - 13th ed., rev. The Nicomachean ethics. : Translated by D.P. Chase. Microform in Gujarati - Āvr̥tti 1 lī. in Ancient Greek - Ed. 3. Curavit Otto Apelt. 1911, J.M. Dent & sons, ltd., E.P. Dutton & co.
in German - 2. Aufl., der neuen übersetzung 1. Aufl. Übersetzt und mit einer Einleitung und erklärenden Anmerkungen versehen von Eug. Rolfes. Nikomachische Ethik. : Übersetzt und mit einer Einleitung und erklärenden Anmerkunden versehen von Eug. Rolfes. in English - 11th ed., rev. 1909, K. Paul, Trench, Trübner & co., ltd.
in English - 11th ed., rev. and adapted to Bywater's text. in English - 11th ed, rev. and adapted to Bywater's text. in English - 10th ed., rev. in Ancient Greek - Editio altera / curavit Otto Apelt. The Nicomachean ethics. : [Translated] with a pref. and explanatory notes by D.P. Chase. in English - 7th ed., rev. 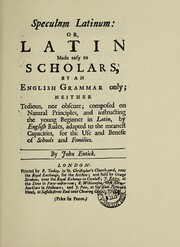 - 6th ed., with revised text. in English - 2nd ed.rev. The Nicomachean ethics. : Translated with an analysis and critical notes by J.E.C. Welldon. The Nicomachean ethics of Aristotle. in English - 14th ed. 1891, Longmans, Green, and co.
in English - Rev. 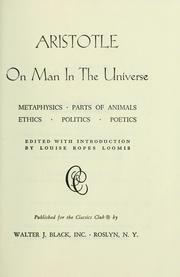 ed / with introductory essay by George Henry Lewes. 1890, Walter Scott Publishing Co. 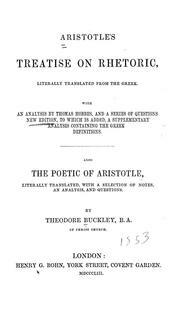 The ethics of Aristotle: with introductory essay by George Henry Lewes. (The Nicomachean ethics.) Chase's translation, newly revised. Ethica Nicomachea. : Recognovit Franciscus Susemihl. 1886, K. Paul, Trench & Co.
1885, Longmans, Green and co.
in English, Ancient Greek - 4th ed., rev. in Ancient Greek - Editio quarta. 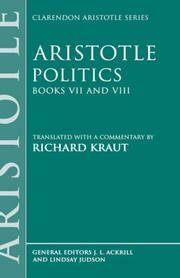 The fifth book of the Nicomachean ethics of Aristotle. 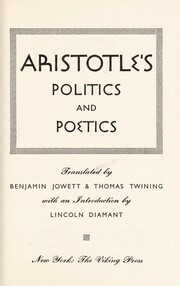 The Nicomachean ethics of Aristotle. : Translated by Robert Williams. --. 1879, Longmans, Green, and Co.
1872, J. Hall & son, etc., etc . The Nicomachean ethics: newly translated into English by Robert Williams. 1866, Longmans, Green and Co.
- 2nd ed., rev. and completed. in English - 3d ed., rev. The Nicomachean ethics of Aristotle. : Translated, with notes, original & selected; an analytical introduction; and questions for the use of students. in Ancient Greek - Ed. 2. The Nicomachean ethics of Aristotle. : Tr. with notes, original & selected; an analytical introduction; and questions for the use of students. 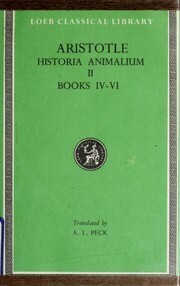 in Ancient Greek - Iterum edita. Ethica Nicomachea. : Ex recensione Immanuelis Bekkeri iterum edita. Ethicorum Nicomacheorum libri decem. : Ad codicum manuscriptorum et veterum editionum fidem recensuit commentariis illustravit in usum scholarum suarum edidit Car. Lud. Michelet. in Latin - Ed. 4. 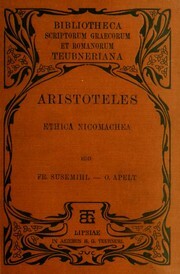 Aristotelous thikn Nikomachein biblia deka. : Aristotelis ethicorum nicomacheorum libri decem; codicum MSS. collatione recogniti et notis illustrati a Gulielmo Wilkinson. in Greek - Ed. 2. Publish date unknown, J.M. Dent & Sons, Ltd., E.P. Dutton & Co.
in English - Penguin Classics Edition. 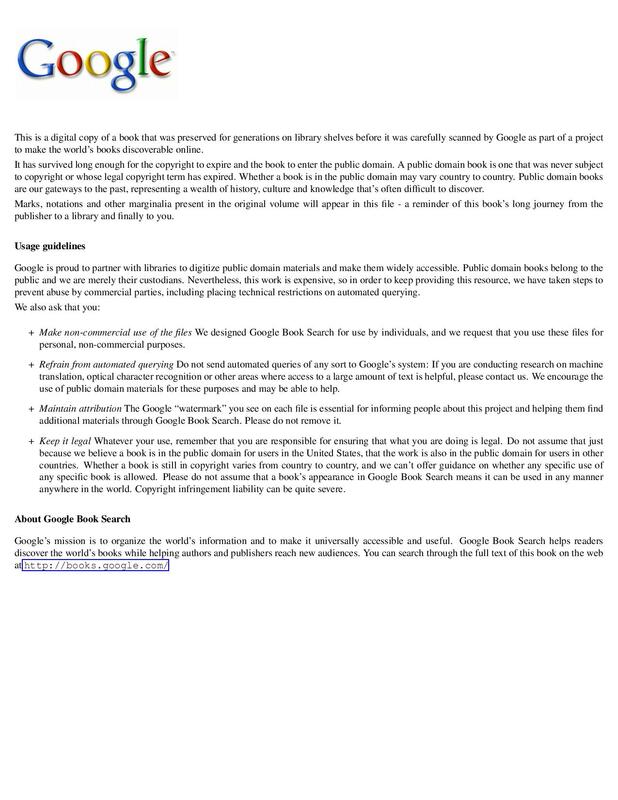 July 15, 2018 Edited by Charles Horn Edited without comment.